I can’t believe I’m still swimming! 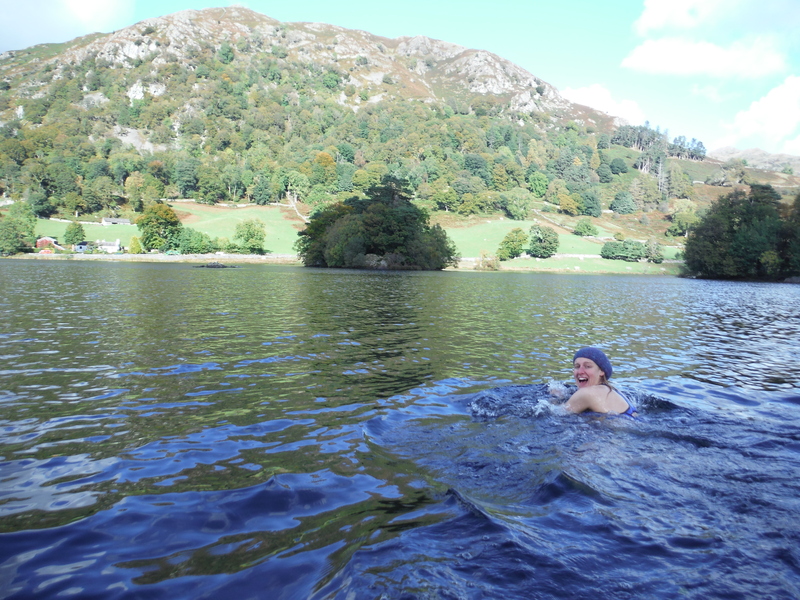 We’re well into October now but the weather is holding (although there is definitely an autumnal chill in the air now) and I’m still really enjoying the swims. For the last few weeks I’ve been very conscious with every swim I’ve done that it could be my last one for the year. 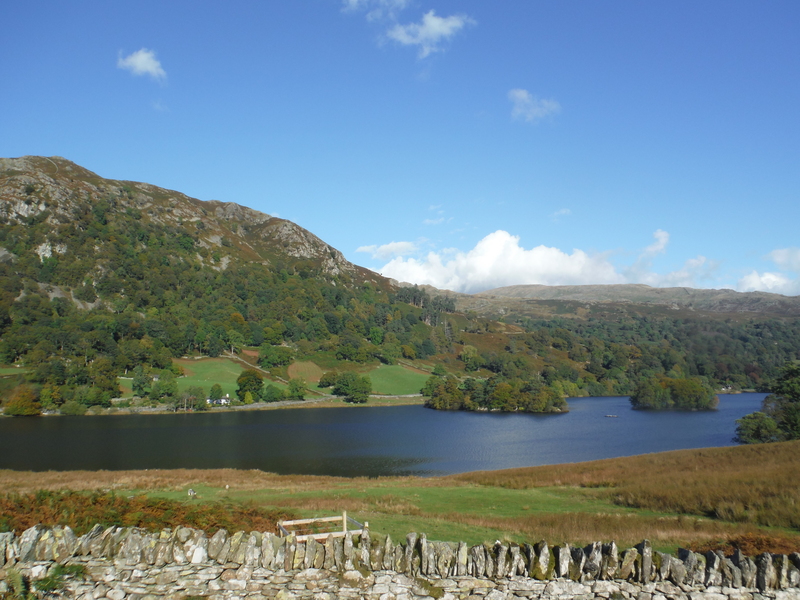 But as the benchmark of fifty lakes and tarns has crept slowly closer I’ve been more and more determined to make it before the weather gets too cold – and today I did it! Fifty swims done! It feels amazing, fifty feels like such a big number and it really feels like I’m well on my way. Today was also extra special as it was the first time Hannah has managed to come with me. 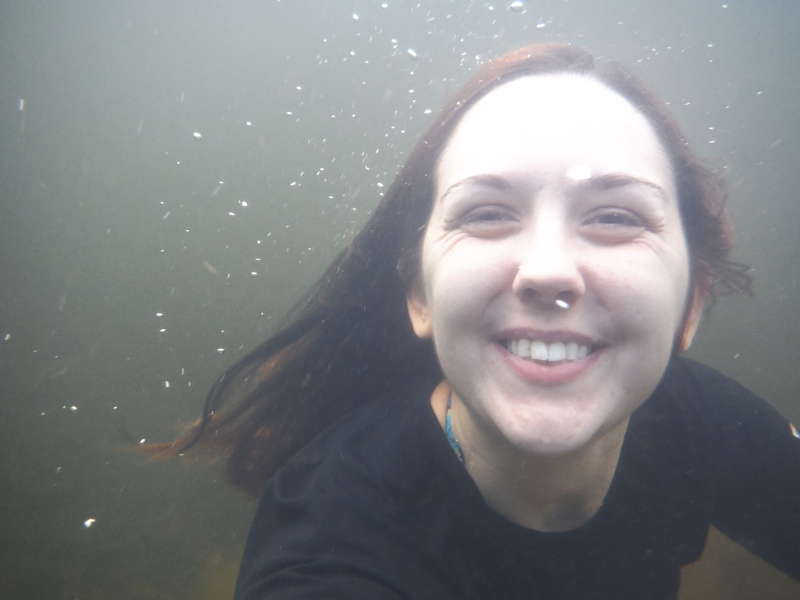 She was one of the earliest people to be enthusiastic about this project and really encouraged me not only to do the swims but also this blog and to let people know what I’m doing. She’s faithfully read every blog post and has been really keen to come with me from day one, but our completely opposite timetables have meant that it’s never happened. 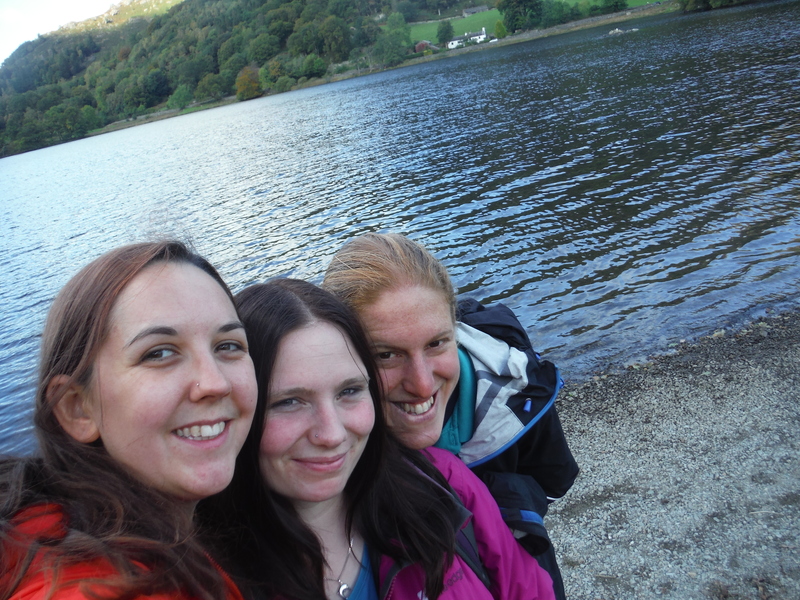 But today we were both free and we set off this morning feeling positive about the day ahead. 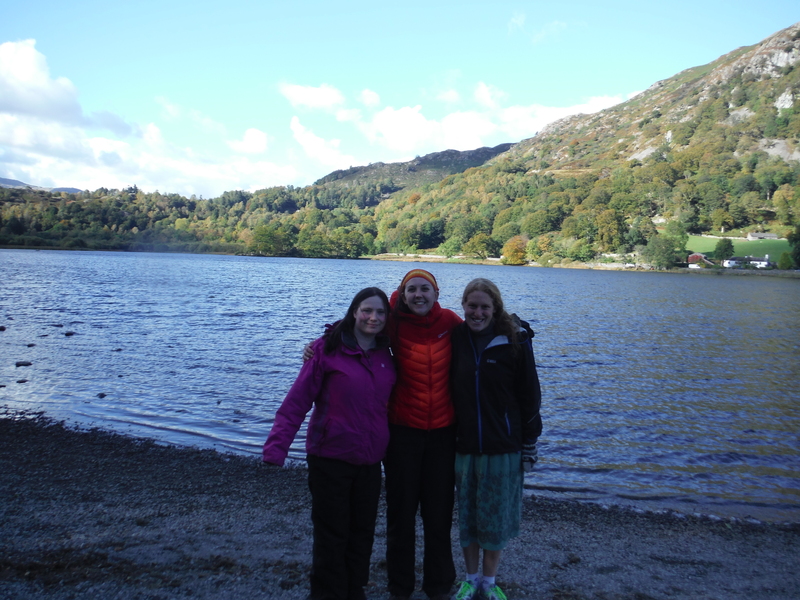 We picked Katy up in Keswick and headed down to White Moss car park between Rydal Water and Grasmere. The walk around the side of the lake was lovely and we admired the new(ish) footbridge over the little stretch of river between the two lakes. 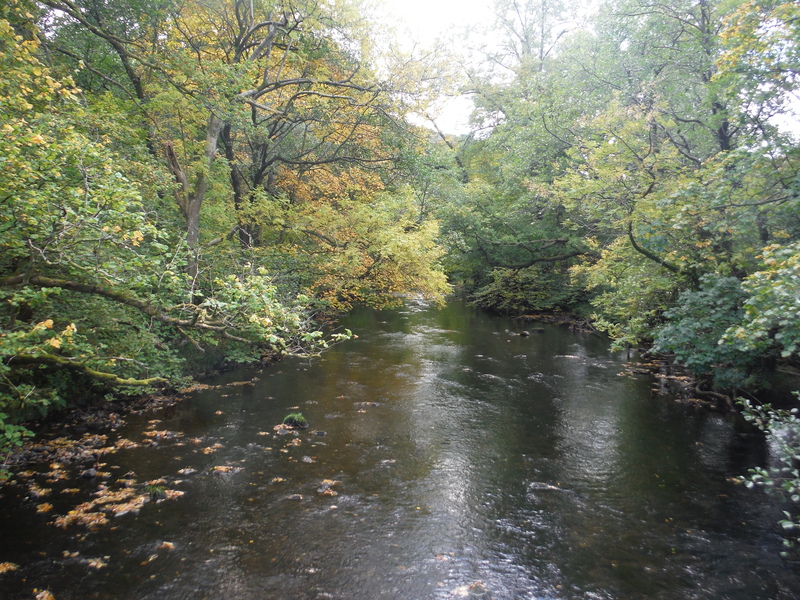 The leaves are really starting to turn now and the trees overhanging the river were thick with green, gold, red, orange and yellow. As we got out of the woods and onto the open ground we were all surprised by a brown cow, coming towards us suddenly near the path. 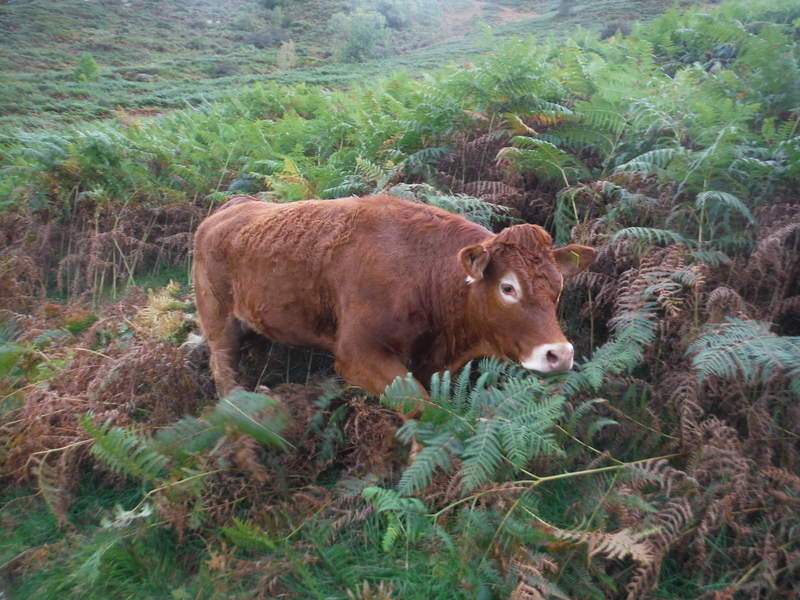 It was walking through the bracken and had been perfectly camouflaged against the autumn colours until it moved! The sun was peeping in and out of the clouds and the lake looked beautiful as we headed down towards it, the trees on the islands glowing and Nab Scar rising behind. Where the path reaches the edge of the lake there is a gravelly beach, perfect for swimming from. We looked at the map and decided to swim around Heron Island – as it reaches almost to the far bank, swimming out to it, round and back would be far more than the distance once across the lake (the minimum distance required). 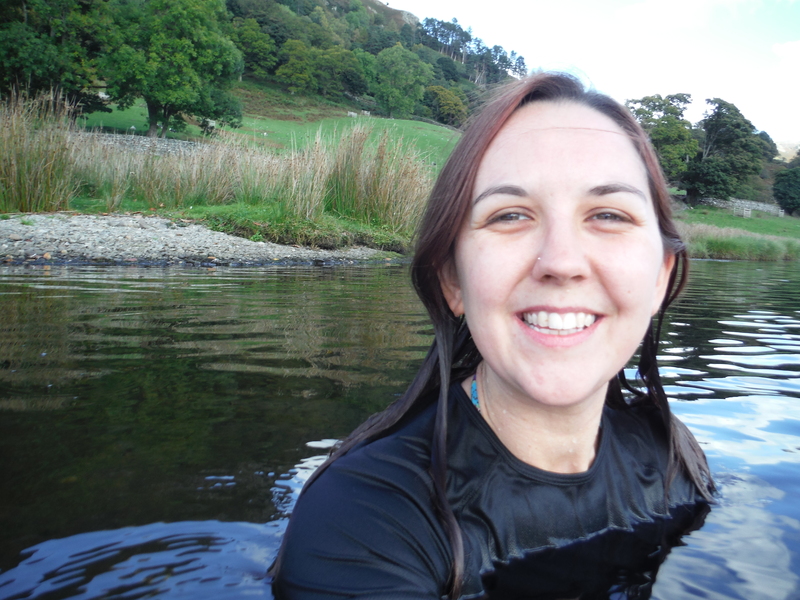 Hannah decided to see if she could find Rydal caves while we swam. Despite the intermittent sunshine there was a definite nip in the air and once we were ready to swim there was no hanging around. Katy, as usual, was straight in there and swimming while I was still slowly trying to get my legs used to the cold. But I tried not to spend too long getting in and actually the water temperature was not too bad. 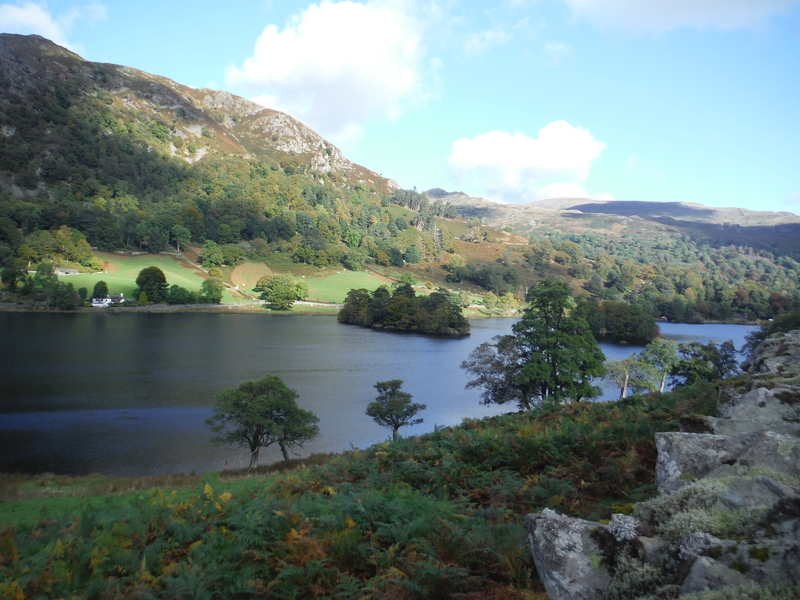 Rydal is very shallow and relatively low down so it was not as cold as some of the others in the last few weeks. I’d once again chosen to swim without my wetsuit as I’ve been enjoying it so much. It’s such a different experience, the feeling of being totally immersed in the water, the cold on your skin – the cliché holds true, you really do feel much more ‘at one’ with the water. 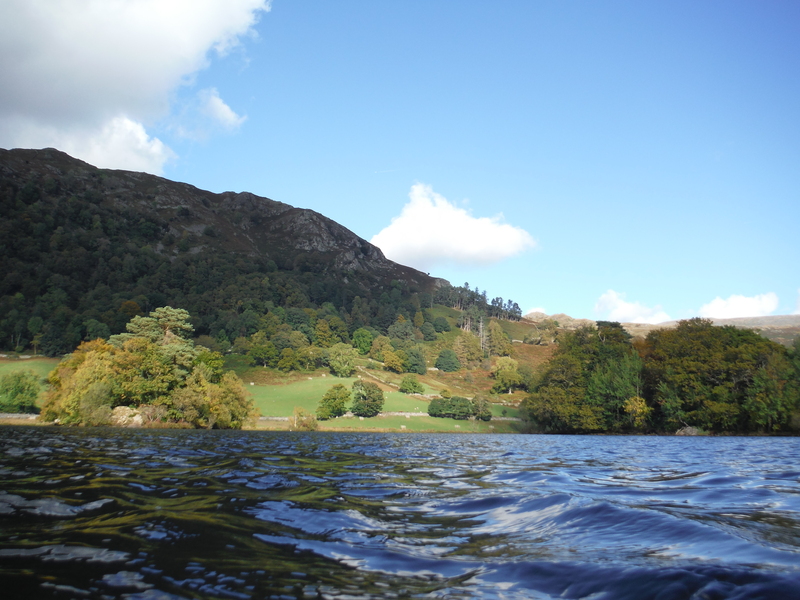 Rydal Water really is very shallow, especially as we had chosen to swim close to the islands and in some places I even managed to bang my knees on the floor. I’ve swum here once before in the height of summer and remember is being very, very weedy. It wasn’t so bad today, although the weeds still made themselves known! By the time I was level with the island Katy had turned around and was swimming back towards me. We took a couple of pictures and she decided to head back to the shore. I kept going, really wanting to swim around the island. But by the time I got to the end of it I realised that it was so close to the far shore that it was ridiculous not to go right across. I swam right into the shallows at edge but didn’t want to get out of the water only to have to get back in again, so took a quick picture of myself sitting in the shallow water and set off back, this time heading down the other side of the island. This was the worst place for weed, slimy, fluffy and thick, stroking my arms and legs as I swam. But the water was starting to feel almost warm as my body adjusted itself and as I headed back the sun slid out from behind a cloud and I felt its warmth on my face. 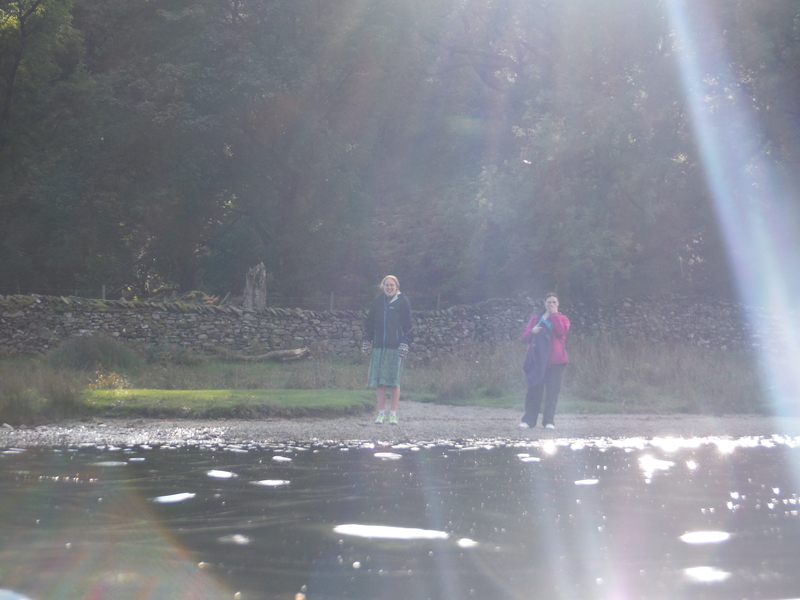 Unfortunately it was directly in from of me, so it was shining right into my eyes, doubled in intensity as it reflected off the water but it was worth it as I felt it’s warm rays on my skin. I swam for a little while with my eyes closed, just enjoying the sensations of the water and the sunshine, shutting out the blinding light. I was in the water for a little over half and hour and when I got back to the shore Hannah was waiting with my towel ready and immediately wrapped it around me in a towel-y hug. Katy was already dressed and was running up and down the bank in an effort to keep warm. A breeze had blown up just as I was getting out of the water and all my sensations of warmth instantly left me. Although I had got used to it the water really was very cold and I was shivering madly as I tried to change into my dry clothes. 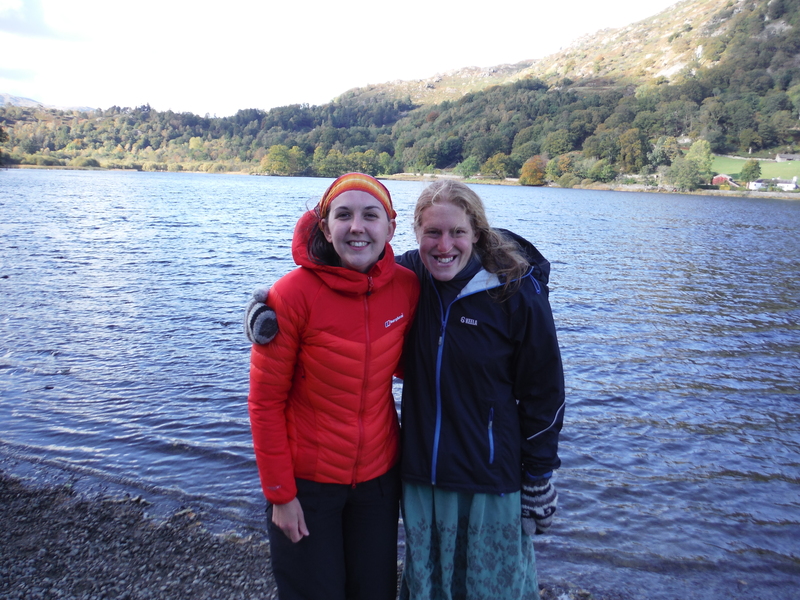 I’d brought a flask of hot chocolate with me and Hannah poured some out while I fought the familiar battle with wet towel, damp skin and unwilling clothes. 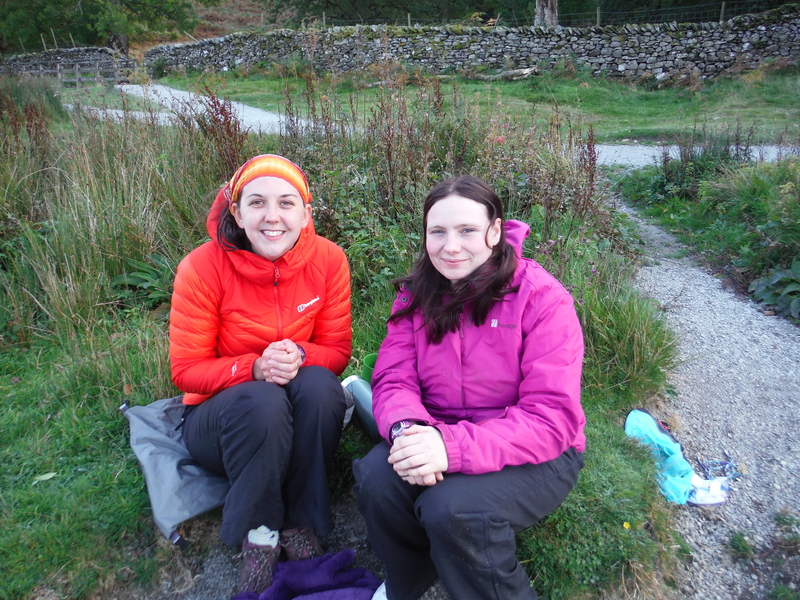 We hurried back along the path to the car park, trying to encourage some feeling back into our icy fingers and toes and sat in the car with cups of hot chocolate, crisps and Jamaica ginger cake to warm us back up. Another wonderful day of swimming with great people. I’m enjoying this challenge so much at the moment and it feels so good to have hit the 50 mark. I wonder how many – if any – more swims this year will hold before it becomes too cold.